The P.9000 automatic calibre with a power reserve of three days, created entirely in house in the Officine Panerai manufacture, meets a Radiomir case for the first time in the new Radiomir Black Seal 3 Days Automatic. The Radiomir case in polished steel is 45 mm in diameter and has a black dial of sandwich construction, faithful to the traditional Panerai aesthetic with its alternation of linear hour markers and large figures at the cardinal points, small seconds dial at 9 o’clock and date at 3 o’clock. On the back, a sapphire crystal gives a view of the P.9000 movement and in particular of the oscillating weight which operates in both directions, winding the two spring barrels while the watch is being worn. 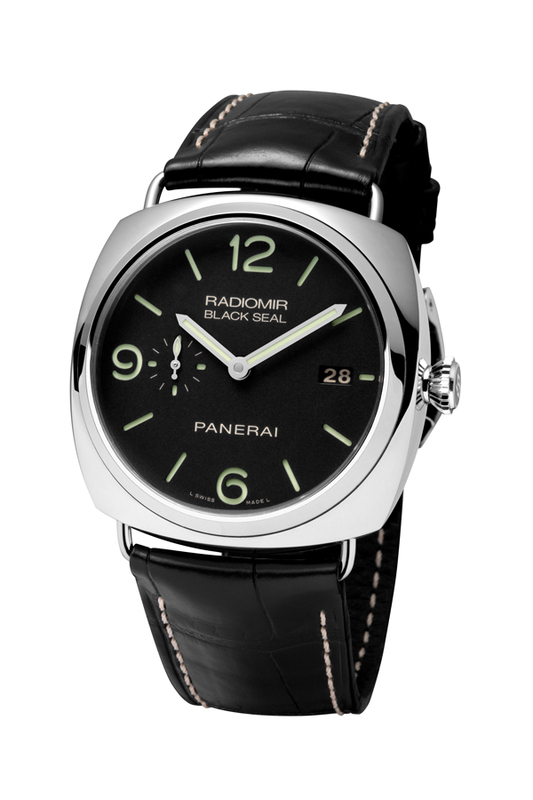 The P.9000 calibre of the Radiomir Black Seal 3 Days Automatic is 13¾ lignes in diameter and 7.9 mm thick. It has a balance which oscillates at a frequency of 28,800 vibrations per hour. As well as the time and date functions, the P.9000 is fitted with the device for rapid setting of the hour hand: a star wheel with 12 teeth and a small spring clutch enable the hour hand to be moved forward or backwards in clicks of one hour at a time, without interfering with the progress of the minute hand or the running of the watch. The same device is connected to the date, which is adjusted automatically when the hour hand is moved forward or backward past midnight. The Radiomir Black Seal 3 Days Automatic (PAM00388) is fitted with a black alligator strap, attached to the case by wire loop strap attachments which can be removed (patented Officine Panerai), enabling the strap to be easily replaced. Automatic mechanical, Panerai P.9000 calibre, executed entirely by Panerai, 13¾ lignes, 7.9 mm thick, 28 jewels, Glucydur® balance, 28,800 alternations/hour. Power reserve 3 days, two barrels. Hours, minutes, small seconds, date. Diameter 45 mm, AISI 316L polished steel with removable wire loop strap attachments (patented). Screw-down winding crown personalised OP. Black with luminous Arabic numerals and hour markers. Date at 3 o’clock, seconds at 9 o’clock. Sapphire, formed of corundum, 1.9 mm thick. PANERAI personalised alligator strap and large-size polished steel buckle. 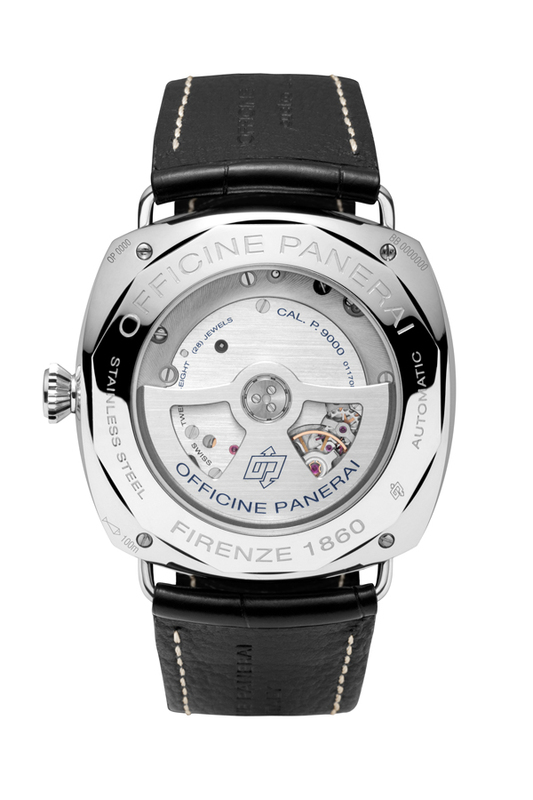 * Officine Panerai is not the owner of the Glucydur® and Incabloc® trademarks.